University of Redlands President Ralph W. Kuncl writes to the U of R community on Feb. 25 about an historic action by the Board of Trustees and its meaning for the University. Here is his text from his memo. Three days ago at the meeting of the University of Redlands Board of Trustees, an historic vote took place. It is an honor to be associated with the University in this moment, and it is a privilege to be the bearer of this news today. The announcement is of the formation of a permanent partnership with a like-minded institution that will greatly strengthen and expand the U of R, and in so doing, ensure its bright and vibrant future and its ability to transform even more students’ lives, for generations to come. The Board voted to adopt an “Agreement in Principle” to move toward the acquisition, anticipated by July 2019, of San Francisco Theological Seminary (SFTS) in order to form a new graduate school at the University of Redlands—the Graduate School of Theology (GST)—and a new regional campus in the Bay Area. This acquisition, assuming it comes to fruition over the next four months as planned, will represent the first major structural change to the University’s academic offerings since 1976, when Whitehead College was created to serve a new generation of non-traditional students. This action also represents the first expansion of our geographic footprint into Northern California. “What? Why? Who?” you must be saying. I look forward to telling faculty, staff, and administrators more about this news in the President’s Annual Forum, Wednesday, February 27. [...] Faculty will have additional opportunities to discuss this announcement beginning with the next University Academic Assembly on [Friday,] March 15 at 3:30 p.m. For students, we will also be holding forum sometime in March, on a date to be selected by student leaders and deans. For now, I’ll give you a few points about the U of R-SFTS relationship that are particularly important and exciting. 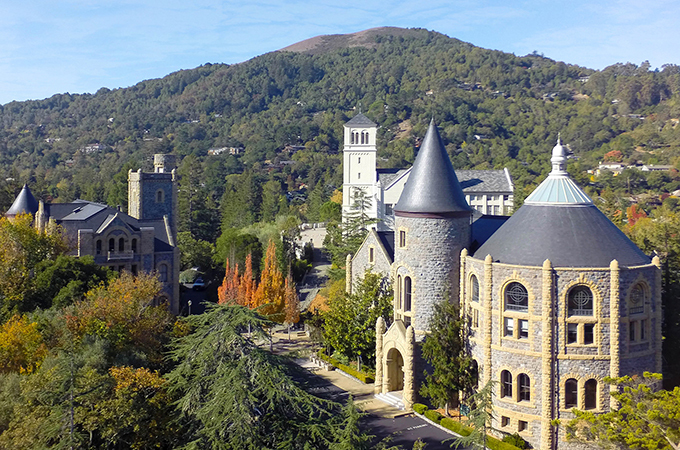 The prospect of a permanent partnership between San Francisco Theological Seminary and University of Redlands presented unique and compelling possibilities from the moment SFTS’s leaders approached us, as their institution’s desired partner and potential acquirer, a little over a year ago. We share a core set of values and interests, which are reflected in each institution’s vision for teaching, scholarship, and community. We are both committed to exploring and expanding academic and career pathways for students. We stand to enhance those pathways by combining key strengths of both institutions into the new Graduate School of Theology, which will join and stand on equal footing with our Schools of Business, Education, and Continuing Studies in creating new degree pathways for all students. As mentioned, the GST also will significantly expand the reach of both institutions by extending our geographical footprints across California. The many synergies between SFTS and the U of R have already been demonstrated in our collaborative development of a brand new, joint certificate program with our Schools of Education and Continuing Studies in the mental health counseling arena, which has already attracted enrollees. At its core, this partnership is squarely aligned with the goals of our strategic plan, North Star 2020, to enhance graduate and professional education, and it is a major opportunity to enhance and expand two institutions of long standing and high quality that also share significant interests. We are deeply excited about the benefits to be realized. The GST will bring a new set of multi-disciplinary graduate programs that greatly diversifies our educational offerings, and thus our revenue streams. The addition of SFTS’s healthy endowment and eight endowed professorships will increase U of R’s financial and faculty strengths. Our acquisition of SFTS’s valuable, one-of-a-kind campus property located in Marin County, just north of the city of San Francisco, enables us to host new School of Education cohorts, School of Business cohorts and Capstone projects, as well as conferences and events, and, eventually, programming for College of Arts and Sciences students such as May Terms and First-Year Journeys. Establishment of a University presence within the economic force that is the Bay Area offers unique academic and career (networking, internship) pathways for our students and gives us an anchor in a prosperous region that is home to many of our alumni, as well as an entirely new market in which we will attract prospective graduate students. And, specifically for alumni, the new campus will be an asset to benefit Bay Area alumni programming and will also give alumni who wish to return to their alma mater for an advanced degree access to local School of Education and School of Business programs. I look forward to telling you more about this major event in the evolution of our University. [...] You may begin to see news coverage on the topic, as mergers and acquisitions are fast becoming commonplace in higher education. You can visit the Bulldog Blog for more details on the news, and we’ll post updates here as they happen. We welcome the community’s comments and questions. Please feel free to send an email to communications@redlands.edu.